Coumarin is a toxic, fragrant chemical compound commonly found in high concentration in Cassia Cinnamon, the cheap hard Cinnamon sticks you find at your local grocery store. According to the German Bfr Coumarin causes liver damage. While the effects are apparently reversible according to them, the danger is still very real if you are a especially sensitive person. Studies in rats have also found that Coumarin in very large doses over long periods of time did provoke cancer in rats and mice, although there is no evidence it does the same for humans. If you have liver disease, damage or failure, check to see if you have been consuming high levels of Cassia Cinnamon or Cassia Cinnamon based products. And if you have been popping those popular Cinnamon tablets check to see if they have been made with Cassia Cinnamon. If they have been made with Cassia Cinnamon, you may have caused great harm to your liver. There are also alleged that even some Ceylon Cinnamon tablets contain Cassia Cinnamon. Some manufacturers maybe be constituting tablets with a mixture of Ceylon and Cassia Cinnamon. Coumarin is also contained in a number of other products, most notably in Tonka beans, Vanilla grass, Sweet Woodruss, Mullein, Sweet grass according to Wikepedia. The name Coumarin comes from the French for Tonka bean, which is coumarou. Interestingly while Coumarin is banned in the United States as an additive or as constituent of Tonka beans, Coumarin in food from other natural sources such as Cassia Cinnamon is not regulated. Is this a huge error on the part of the US Health authorities? When you consider the huge amount of Cassia Cinnamon consumed in the United States and the fact there are 30 million cases of liver disease you start to wonder. Have you been eating quite bit of Cinnamon Toast Crunch or Cinnamon Toast Waffles? 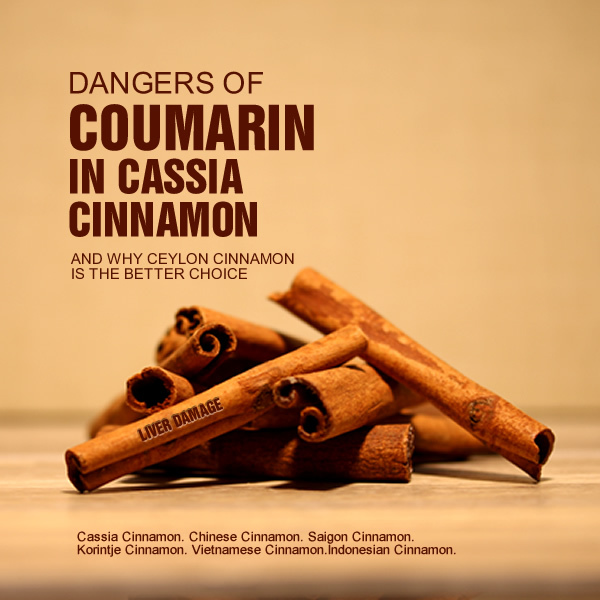 Perhaps now is the time to switch to Ceylon Cinnamon, which has less than 0.02% Coumarin while Cassia Cinnamon has in the region of 0.4 – .8% which is considered damaging to your liver at this level. The European Food Safety Authority (EFSA) established a tolerable daily intake (TDI) of 0.1 mg/kg body weight according to this University of Mississippi study of April 2013. Partly funded by the FDA and efforts of Ananda Wickramasinghe, the former Sri Lankan consul general in Los Angeles, this latest research project has exposed the hidden dangers Coumarin. “ If an average coumarin content in Cassia cinnamon of 3000 mg per kilogram of cinnamon is assumed, the TDI value can be exceeded by consumers who eat a great deal of Cassia cinnamon. For an adult with a body weight of 60 kg (132lb), the TDI value is reached, if 2 g of Cassia cinnamon are consumed per day. For an infant with a body weight of 15 kg, this is the case if 0.5 of Cassia cinnamon are consumed per day. Overall exposure can be increased by other sources, for example coumarin-containing cosmetics. Consumers who frequently and regularly eat cinnamon-containing foods should be aware of this. The BfR still recommends that Cassia cinnamon is consumed in moderation. Consumers frequently using large quantities of cinnamon as a condiment should therefore opt for the low-coumarin Ceylon cinnamon “. The University of Mississippi report goes onto look at Coumarin content in various common food products available in the United States, and found high levels of Coumarin,. Of particular concern was the Coumarin levels in Cinnamon dietary supplements, which is astronomically high. If you are taking Cinnamon on a daily basis, then there is the real possibility of Coumarin build up your system, even if your daily intake does not exceed the maximum levels. The chart below shows a brief extract of the research project, but take a closer look at the full report for detailed information. 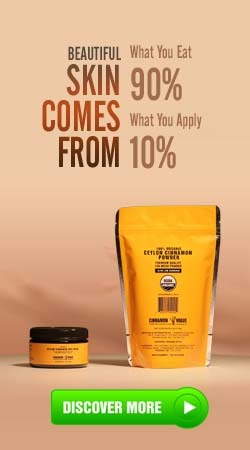 As expected the report shows that Ceylon Cinnamon has ultra low levels of Coumarin as to be totally insignificant, while all other types of Cinnamon exhibited high levels of Coumarin, especially Saigon Cinnamon. The chart below shows an extract of these findings. Even if you switch to Ceylon Cinnamon for your capsules, we feel that ingesting Cinnamon capsules does not represent a good choice because of the inherent danger of their production methods. (Click here for more information on the dangers of Cinnamon capsules). If you are taking Ceylon Cinnamon for health benefits, then stick to good quality natural Ceylon Cinnamon Sticks. Ceylon Cinnamon powder or Ceylon Cinnamon Black Tea infused with Ceylon Cinnamon Bark Oil. Ceylon cinnamon has a mild yet slightly sweeter taste. Ceylon Cinnamon is not overtly spicy and harsh like Cassia Cinnamon, but creates a more sophisticated flavor profile in fine desserts recipes and Asian curries. Boiled Ceylon Cinnamon sticks made into a deep reddish tea is a fabulous taste treat with many health benefits without the downside of Cassia Cinnamon. This entry was posted in GMO, Food Coloring & Other bad Food and tagged couamarin in cassia cinnamon, couamarin in saigon cinnamon, couamarin side effects, coumarin levels in types of cinnamon, liver damage from coumarin in cassia cinnamon, ultra low coumarin ceylon cinnamon by . Bookmark the permalink.